That’s the opening line from an article I wrote called “The Case for a Valuation Disclosure Requirement.” It argues that the SEC should require companies that sell stock in a private or public offering state the pre-money valuation they set for themselves in their offering document. 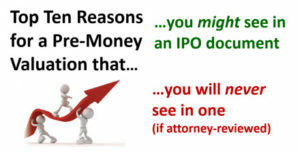 The article didn’t address a question, “If an issuer is required to disclose the pre-money valuation it gave itself, should it also be required to discuss how it arrived at the figure?” It’s an intriguing one because no one knows how to reliably value a venture-stage company, one whose existence is dependent on new infusions of capital. That banal statement all that was said about the (undisclosed) pre-money valuation for Alibaba Group in its 2014 offering document. It was the largest IPO in history. If required to explain a valuation, many issuers will say something similar. The world doesn’t need more junk-speak, so I oppose a requirement to explain what determined where a valuation was set. That said, if issuers must disclose their valuation, some may want to say something about it. That is especially true for a small IPO, such as one based on SEC Rule CF (crowdfunding), which be used to raise $1 million, or Reg. A+, which can be used to raise up to $50 million. Small companies tend to set their pre-money valuation without guidance from intermediaries who assemble investors capable of making a significant investment. Investment banks provide such feedback but that doesn’t mean that the valuation of a Wall Street IPO is more rational. That’s because it isn’t based on the issuer’s expected operational performance. Rather, it is driven by what the banker thinks secondary market investors will pay. A discount of 15 to 20 percent is applied to that, which enables the best customers of broker-dealers in the banker’s deal syndicate to flip their shares at a quick profit to average investors. That is how the pre-money valuation is set for large IPOs, but it will not be described that way in a prospectus. After all, that could create cynicism that can undermine the investment bank business model! 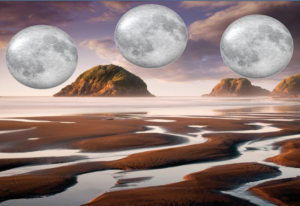 If any explanation is provided for an underwritten offering, it may look like this. • other conditions that affect our business. Small IPO issuers don’t have a selling machine to stir and probe demand. They make their case directly to investors who are likely to have a more long-term perspective on the stock. Those issuers are likely to discuss their valuation in greater detail. Many will struggle with what to say though. Just as it’s hard for an investor to evaluate a valuation, it is a challenge for a company to explain why it set one where it did. The predecessor to NBC’s Late Night with Seth Meyers show was Late Night with David Letterman. A staple of Dave’s show was a “Top Ten” list of dryly humorous explanations for various things. In that spirit, I offer two lists of explanations for a pre-money valuation. The first are explanations that you might see if the SEC requires valuation disclosure. The other has those you will not see (if it is reviewed by issuer’s attorney). 10. We applied a multiple of 2.3X to our projected revenue for next year. 9. We applied a multiple of 8X to our projected income in three years. 8. We need $10 million and our founders want 55 percent of the company, so that works out to a valuation of $8.2 million. 7. A valuation expert assessed our projections and risk factors, then used a sophisticated model to set a valuation range; we selected the mid-point. 6. We expect to be worth $40 million within 3 years, so we valued the company at $10 million to offer those who invest now an attractive deal. 5. Our management team is worth it. 4. We created a five-year income projection and assumed a constant growth rate thereafter. To this, we applied a cost of capital of 18 percent to arrive at the present value of our company. 3. We met with lots of smart people and came up with a figure that made sense to everyone. 2. Firms in Silicon Valley and New York City are reportedly being valued at $500 million—we’re based in the Midwest, so we offer a discount. 1. Our principal competitor has twenty times more customers than we do, but our product is better, so we should be valued at a premium. 9. Our potential market is $6 billion in size; we expect to own one percent of that. 8. VC backed companies are getting that. 7. Consensus figure from our Ayn Rand book club. 6. (Number of founders X $5 million) + (number of engineers X $2 million). 5. We sense an opportunity. 4. Our business model is disruptive. 3. We intend to be the top player in our space. 2. We applied a multiple to our projected loss, then changed the negative sign to a positive. 1. If all goes well, it’s reasonable! 1. No one cares about stock compensation disclosures. Everyone who relies on the financial statements to evaluate a company adjusts off any stock-based comp charges to get a pro-forma income figure that useful. Stock comp expense is ignored because it is a non-cash expense that has no bearing on the financial health of a company. 2. Though pre-money valuation is of keen interest to investors and would cost nothing to calculate or disclose, it is not a disclosure requirement. I call it the Fairshare Model because it balances and aligns the interests of investors and employees…capital and labor. The book should be published by July 2018. This entry was posted in Uncategorized on February 16, 2018 by Karl M Sjogren. The U.S. Securities and Exchange Commission can help investors protect themselves from overpriced stock deals if it requires valuation disclosure in offering documents. Valuation is occasionally cited in news reports but many people are unsure what the word means, let alone know how to calculate one. Briefly, valuation is the presumed price to buy a company, based on its stock price. When new shares are sold, savvy investors focus on the “pre-money valuation,” which is the number of shares outstanding before the offering times the price of a new share. The number is important because the buy in valuation is a key determinant of an investor’s eventual return. Whether privately held or publicly traded, a company’s valuation should approximate what it might be acquired for. Often, it doesn’t, especially if it is a venture-stage company. Such a business is often unprofitable, has questionable prospects and will need capital from future investors to operate. A venture-stage company is difficult to value reliably. Assume a scenario where such an enterprise, ABC Company, is raising capital at a $50 million pre-money valuation. How might an investor evaluate an investment? If she knows the valuation, she is likely to pose a question like this one. If the investor does not know the valuation, she might instead ask, “Why should I invest at $X per share?” But this is not meaningful. Many combinations of share prices and shares outstanding can result in the same valuation. Both numbers are used to calculate a valuation, just as two hands are used to make a clap. The key question is “Why is ABC Company worth $50 million?” and investors who fail to ask it are more likely to make a poor decision, even when they are right about the company’s ability to achieve its potential. That’s because one can overpay for a position in a successful company. Valuation is a vital data point and investors should not, as they do now, have the burden of calculating it. Many do not know how to. Others may be uncomfortable doing so or forget to. Some may calculate it incorrectly. But if the amount is declared in an offering document, anyone can see what it is. But the SEC does not require valuation disclosure. It assumes that investors can and will calculate it themselves. This is remarkable, given how important the figure is and how likely it is that an investor will fail to correctly calculate it. It is also odd, when one considers how many pages of an offering document are devoted to risk factors while a valuation can be expressed in a single sentence. Venture capital and private equity firms absolutely know the valuation of companies they invest in. They also have insight on comparable valuations via their network and fee-based research services that rely on voluntary disclosure from private companies. Angel investors tend to know a company’s valuation but have less market insight than VC and PE firms. In stark contrast, only a small fraction of a company’s public investors is likely to know it’s valuation and few of them will know how it compares. This is not the hallmark of a healthy, open market. The beneficiaries of a valuation disclosure requirement will be numerous. That’s because data aggregation services can be counted on to harvest data points about private and public offerings from the regulatory database and use it to create rich content. For example, valuations could be associated with the amount raised and when, with an issuer’s industry, location, financial data and other factors. Such insight can enhance capital markets in ways that Zillow and Trulia benefit the real estate market. Together, an issuer’s valuation disclosure and access to robust market data will position any investor, not just the professional ones, to ask questions such as these. ABC Company appears to be like XYZ Company, which was recently valued at $40 million. What makes ABC worth $50 million? The average valuation for companies at ABC’s stage of development is significantly different; what explains that? ABC’s valuation is comparable to companies with backing from major VCs. Given that ABC doesn’t have such support, shouldn’t it be lower? Such data can help companies avoid the problems of raising capital at excessive valuations. Doing so encourages arrogance about Other People’s Money and naïveté about future raises of capital. The effects of either is bad and painful to recover from. Companies that offer a below-market deal will benefit because more investors will recognize that one is offered. The data will also help investors evaluate an issuer’s valuation trend; to compare its IPO valuation to what it was in its pre-IPO offerings. A likely result of such analysis will be realization that much of the appreciation may not be explained by better performance or reduced risk but instead, by the notion that public investors should pay (a lot) more than private investors. That presumption is sure to be challenged as public investors wise up. Valuation disclosure sets the stage for these all these things to happen. Issuers will feel compelled to compete for investors, much like merchants do for customers. Some in the investment business will scorn this prospect. It erodes the influence of clubby networks and seems, well, undignified. But competition is the cornerstone of capitalism and economies are more vibrant when they are as open as a bazaar. Some believe, mistakenly, that the SEC approves an issuer’s valuation. It doesn’t. Rather, the agency assesses whether an issuer complies with disclosure requirements that caution caveat emptor. A buyer beware tone makes sense, especially for valuation, because there is no reliable way to assess what one should be. Besides, in a market economy, prices are set in the market. But a Don’t Ask, Don’t Tell position does not make sense. If one doesn’t know what valuation it is, how can it possibly be judged? There is a clear role here for government, the SEC, to promote transparency and competition. Absent a regulatory requirement, valuation disclosure will not be commonplace. Attorneys will advise issuers to not do it, citing concern that disgruntled investors might later argue the company represented itself as being worth the valuation. An undaunted CEO will find the task more complex than just providing the figure because the prospectus will also need to explain what valuation is. The following concept formula summarizes why government is needed. Buyers in most markets—housing, clothing, food, etc.—know that there can a difference between price and worth. Such items have utility, so it is easy to judge worth. It is harder to evaluate a price for something that do not have utility, like a stock. That’s because it’s hard for anyone to know what one is worth. Those who are valuation unaware are further disadvantaged in making a judgment—they do not know the “real” price. Grocery stores demonstrate the potential benefit of valuation disclosure. Unit pricing helps shoppers evaluate and compare products. When it’s not present, they must calculate the price per pound, per ounce, etc. Many don’t because they are hurried or uncomfortable to doing so. Absent unit pricing, food companies compete based on brand, advertising, packaging and shelf position. With it, there is more emphasis on value for the price. Nutritional fact panels take the analogy further. Disclosure of ingredients and nutritional information encourages manufacturers to offer healthier foods. Similar dynamics are possible in the market for equity securities. Funnier still is the tale of Mannatech, Inc., whose shares shot up 368% in the first two days following the initial public offering. Tech-crazed investors were keen to invest in anything to do with the internet and a company called Mannatech certainly sounded like it fit the bill. The only problem was that Mannatech makes laxatives. Prior to this offering, there has been no public market for our [Alibaba’s] shares. The public offering price has been determined by negotiation among us and the underwriters based upon several factors. Well, golly gee-whiz! Knock me over with a feather! That’s such a meaningful bit of information! Seriously, if that’s what will be said about a valuation—and it typically is—why bother saying anything? Implicitly, Alibaba, like other issuers that similarly describe how their IPO price is set (i.e., virtually all of them), ask investors to view the matter as if it were the birth of Athena, the goddess of wisdom in Greek mythology. 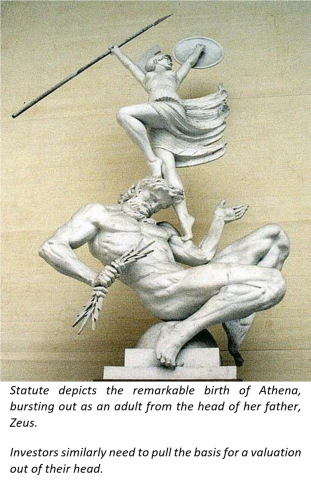 Rather than emerging as an infant from a womb, she was born fully formed, as an adult, springing out from the head of her father, Zeus. Perhaps it is not coincidental that Athena is also associated with purity, for she remained sexually chaste. IPO issuers who make such pronouncements suggest that wisdom and purity guide where their valuation is set. The wisdom comes from its management and their investment bankers. Purity is evoked in a virginal sense: the issuer’s valuation is untested in the public market. So, goodness! Who can possibly know whether the one at IPO makes sense? Of course, these factors are based on myth, just as Athena herself. Greed has at least as much sway on the setting of a valuation as wisdom. And all companies have a valuation history. Why it should be considered irrelevant to public investors is a curious matter. After all, private investors routinely consider what a company’s valuation trend is. My point is that it is a challenge is to assess what a business may be worth but wrong-headed for regulators to not require every issuer to be transparent on what their valuation is and, for that matter, what led management to set it where it did. The most straightforward explanation for why the SEC does not require valuation disclosure is that its staff does not see it as an issue. After all, an investor just needs to pull two numbers out of the offering document and multiply them. But, this logic is at odds with lessons learned about pricing from grocery stores. Furthermore, one would think than the agency whose motto is “the investor’s advocate” would embrace approaches that help investors make more prudent decisions and to attract better deals. It could be also that no one has promoted the idea enough. In a moment, I’ll tell you how you can help change that. Public investors are bifurcated into two groups. Those who get IPO allocations are the best customers of the underwriters or those with economic and political influence. Many of them flip their shares to secondary market investors at a higher price. Thus, they are not long-term investors and they are unlikely to see a problem with the Way-Things-Work. The second group is made up of average investors who compete for shares in the secondary market. They tend to be buy-and-hold investors. Since they bid prices up, it appears that there is no reason to change anything; there is no need to make valuation more transparent. But the fact that, in retrospect, many IPO valuations are excessive belies that conclusion. I ordinarily eschew conspiracy theories but I see opposition to valuation disclosure as support for a system that disadvantages average investors. Several regulatory agencies are self-funded, at least in part. They include the Federal Reserve, the Federal Deposit Insurance Corp. and the Office of the Comptroller of the Currency. The SEC is not self-funded; all the money it generates from fees and fines go to the general treasury. That makes it wholly dependent on the Congress for its annual appropriations. This is not happenstance. It enables politicians to leverage their influence over the SEC to raise money for their re-election campaigns. The financial services industry is likely to oppose valuation disclosure because it threatens the business model of its most powerful members. If more investors are valuation savvy; they may be less eager to buy shares in the secondary market from those who get IPO allocations. Thus, lobbyists are likely to discourage legislative support for valuation disclosure. The possible reasons why valuation isn’t a required disclosure now are interesting. What’s important, however, is that you and a few thousand others can help change that. Discussion of factors that were considered when setting it. I support initiatives that encourage market forces to improve investor protections. If the SEC requires this disclosure, more companies may compete for investors by offering lower valuations and other favorable terms. Seriously, if you want to see the ball advanced on this issue, do it! Members of the Congress are highly sensitive to what their constituents say. The SEC is similarly receptive to input from the public. You have the power to influence whether valuation disclosure is seriously considered. It takes no money. It just requires that you to take a moment to express your support for it and ask others to do the same. Some states use their “Blue Sky” laws to evaluate an issuer’s valuation, but, they lack authority over offerings that are registered with the SEC. It will be published about five months after 250 people pre-order a copy from Inkshares, a publisher that relies on reader support to decide what to publish. This entry was posted in Uncategorized on September 18, 2017 by Karl M Sjogren. Metaphors can bring focus to complex situations, like what underlies the troubles of the American and European economies. My allegory conjures moons and tides to create an image that is easy to grasp but difficult to solve. It hints at why public dialogue about what to do about it has, increasingly, taken on toxic qualities. To set-up the imagery, recognize that a mega-trend drives the economic disquiet that is so evident among voters; the return on labor is falling while the return on capital remains relatively high. Here, the return on capital is rents, interest, dividends and capital gains while the return on labor is real wages and proxies for a sense of security, belonging, and purpose. The relationship reflects slow economic growth and rising income inequality. This trend has three interweaving drivers—technology, economic theory and the supply of labor. Their effect came into play in the 1980s and have gathered strength since. Computers and telecom technologies made it easier to perform all manner of work and be more productive. However, and significantly, it also made it easier to relocate where it is performed. Once digitized, work took far less time and effort to recreate. And it was easily shared, willingly or not. Philosophers provide the intellectual framework for movements. Technology enabled schools of thought that led businesses to conclude that they didn’t need to do everything in-house. The initial expression of this idea was outsourcing. It first affected support functions like computer operations and payroll, then migrated to those that had been considered central to competitiveness, manufacturing and customer support. Offshoring was just a skip and a hop away. The outsourcing and offshoring movements were aided by two other economic theories. One was that countries are net beneficiaries of free-trade. The other was that management’s principal duty was to maximize the wealth of shareholders—this exerted a negative effect on the return on labor for non-management employees. Lean organizational philosophies are a variant of the idea that companies need not do everything themselves. They view activities that do not add value to the final product as superfluous and something to eliminate. They are especially popular among emerging companies, which foretells the future of work, given that these types of businesses are responsible for most job creation. The Soviet Union dissolved in 1991. With the end of the Cold War, Russia, along with China, sought to transition from a centrally controlled economy to one that was more market oriented while minimizing political instability. Countries indirectly affected by the Cold War, like India, had adjustments to make as well. As these nations became export oriented, the supply of labor increased significantly. As a result, the battle for the commanding heights of the world economies shifted from one based on political ideology to one driven by market economies. In 1992, the European Union was formed. Member countries came to share a currency; citizens were free to travel, live and work within the E.U. and commerce within it was free of restrictions and border taxes. In part, E.U. countries sought to emulate the United States of America. Additionally, they sought a response to rising imports from Japan and the so-called Asian Tiger countries—Hong Kong, Singapore, South Korea and Taiwan. Similar trade concerns led to the 1993 NAFTA trade agreement between the U.S., Canada and Mexico. “Globalization” was coined to describe what was going on, increased integration of economies around the world. Tribes were an early form of social order for unrelated humans. Often, tribal affiliation reflected familial connection; it always reflected shared interests. Advantages of scale led to city-states, where tribal affiliation weakened in importance. Ancient Athens and Rome were city-states; similar clusters were common in Europe in the Renaissance period. 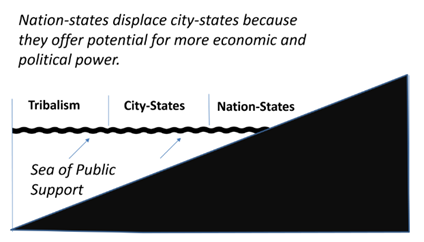 Over time, nation-states supplanted city-states because larger affiliations of common interests promoted economic and political influence. 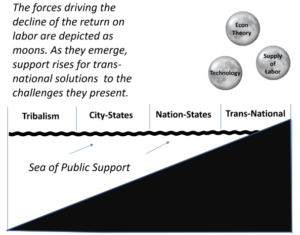 Metaphorically, the tide of support rose to the nation-state level. It remained there until the effect of technology, economic theory and an expanding supply of labor began to be apparent to developed economies. These forces, depicted here as rising moons, created a tide of support for trans-national pacts like the E.U. and NAFTA. It spurred other regional trade activity as well, such as the 2006 framework agreement between Mexico and the Common Market of the South (Mercosur) and the Trans-Pacific Partnership Agreement (TPP) negotiated by the Obama administration. The highwater mark for trans-national solutions is depicted by the effect that the rising moons have on the tide of popular opinion. It was reached in 2016, when the U.K. voted to exit the E.U.—Brexit. Shortly thereafter, Donald Trump was elected U.S. president. He promised to withdraw from the TPP, to cancel and/or re-negotiate NAFTA and to label China an unfair currency manipulator. He summed up his approach as America First, which mirrored his campaign slogan, Make America Great Again. In France, the leader of the nationalistic National Front party, Marine Le Pen was a finalist in the 2017 presidential contest. Each of these political outcomes defied traditional thinking. Collectively, they suggest a dynamic—loss of confidence in trans-national solutions because they didn’t protect voters from the forces that pressure the return on labor. The stock and housing markets made it easier to overlook their effect before the Great Recession. The subsequent job losses, tight credit and collapses in asset values made it impossible to ignore. That pain was felt widely and optimism about the future sagged. Dissatisfaction with the pace of the recovery left voters Mad as Hell but, in a peculiar way. They knew what they were against—the situation they were in. They knew what they wanted—restoration of what they had and more. However, they were unsure how to achieve it and so were the politicians who represent them. Economic growth is measured by the growth in gross domestic product but it comes from increases in population and/or improvements in productivity. Few developed countries see population growth as their economic engine. And it is hard to increase domestic productivity when work can be easily moved elsewhere or, increasingly, to machines. Conventional policy solutions were not designed to address the reasons for the declining return on labor. Lower income taxes, for example, may encourage economic growth but not necessarily domestic job creation—a business that hires locally and pays well can have customers willing to buy from foreign competitors who don’t. Fewer regulatory requirements benefit foreign and domestic producers alike—and fewer regulations can harm domestic providers of services that help businesses satisfy the requirements. Better training can make a workforce be more competitive, but the specter of lower cost foreign workforce will pressure wage growth and job security. When inequality becomes too large to ignore, everyone starts acting strange. It divides us, makes us believe weird things and erodes our trust in one another. 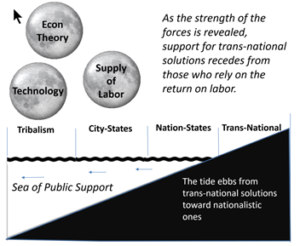 The tide suggests that protectionist trade policies may gain support, which will fuel debate about how to change the effect of one moon, economic theory—little can be done about technology and the supply of workers. It will be a remarkable debate, since economies are more interconnected than ever. Also, because it will confront the grand premise of the dogma of deregulation, free-trade and shareholder wealth maximization…that economies work best when government gets out of the way of its participants. A nation with high labor costs need not resort to protectionism. It can compete based on workforce training, infrastructure, legal process, capital markets and an intolerance of corruption. An economy can compete based attitudes of its participants—entrepreneurs and those who decided to back them; advisers, investors, marketers, suppliers, regulators and even those willing to buy new products. In other words, economies compete based on business ecosystems, not just parts. Unfortunately, a holistic approach offers little solace to those who feel most damaged by the declining return on labor. Perhaps we need philosophers from across the political structure to describe what it means to live a good life in the times we face and what a vital, innovative economy might look like—one that allows for self-actualization by more people. Essentially, we need a framework to re-imagine capitalism. This entry was posted in Uncategorized on June 19, 2017 by Karl M Sjogren. A mega-trend drives economic disquiet in developed countries; the return on labor is falling while the return on capital remains relatively higher. You intuitively sense this. Economist Thomas Piketty provided data to support it in his 2013 book, Capital in the 21st Century. This trend explains the restiveness about anemic economic growth and rising income inequality that is so evident in western nations. Brexit supporters in the United Kingdom reacted to foreign workers who drove down wages. Declining prospects for a better life motivated U.S. voters to elect Donald Trump; immigration and free trade were the lightning rods he raised. Similar sensibilities have a following in France, as evidenced by the support garnered by Marine Le Pen, the nationalist party’s presidential candidate. Technology: the digitization of information makes it easy to relocate work. It is difficult to name jobs where earnings growth is not adversely affected by the ability to move work elsewhere. Robotics and other forms of machine learning have a similar effect—they move work from humans. Management Theory: Beginning in the 1980s, companies decided they didn’t have to do everything themselves. Outsourcing took root with computer operations, payroll and customer support then moved to manufacturing. Offshoring was a skip and a hop away. Lean organizational philosophies are a variation of the idea and they are popular among emerging companies, which provides an ironic foretelling about the future of work. Since the 1970s, these types of employers have been responsible for more job creation than Fortune 500 companies. Greater Supply of Labor: The end of the Cold War led China and India to develop an export orientation and this created wage pressure on workers in higher wage countries. It is unrelenting; China, for instance, faces wage competition from other Asian nations while it competes with western economies for high skill work. The political landscape looks startling different once you recognize the drivers. As different as the moment in The Wizard of Oz when the screen transforms from black and white to color. Essentially, optimism among those who rely on the return on labor has been eroding because it is easier to change where their work is done. In the face of these three drivers, is it possible for today’s job market to look much better? Might protectionist trade policies have significantly blunted their effect? If so, might government administration of those policies made the economy less competitive? We can’t change what these drivers have wrought–the genie is out of the bottle. Today, there are two forward-looking questions. What policies will enhance productivity and thus, economic competitiveness? And, what can be done to ease the social unrest that has been unleashed? Since economies are complex, policy prescriptions tend to rely on indirect cause and effect. Advocates of lower income tax rates, for example, believe that the prospect of higher after-tax income will lead businesses to make investments that, in turn, create domestic jobs. The idea relies on plenty of speculation. Those who favor investments in education also rely on indirect solutions—more education makes a workforce more attractive to employers and that, in turn, creates more and better jobs. Indirect solutions rely on theory, logic and intuition for validation, however, it can be easier to find hard evidence for direct solutions. There is a direct solution for job creation—one that can test the effect of lower taxes on employment. Simply reduce employer payroll taxes. If it costs less to employ people, theory has it that businesses will hire more of them, right? Employers and employees share the payroll tax burden. Employees see their portion on payday but may not realize that their employer pays about the same amount. The self-employed pay both portions. The employer portion is a vestige of an age when job creation wasn’t such a concern and when labor was a larger component of product cost. Increasingly, the cost is in materials with low labor content and business infrastructure/overhead; the drivers of the declining return on labor also reduce its cost. The relationship between taxes and employment is intimate at the payroll tax level; all employers pay it and all would benefit from a reduction. By contrast, a reduction in the income tax rate only benefits employers with taxable income. The correlation between that and the payroll is weak—companies with lots of workers may be unprofitable and profitable ones need not have many domestic employees. 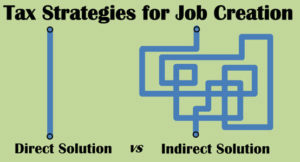 Tax code reform is desirable for many reasons…but job creation isn’t a direct one. Cause and effect between income taxes and job creation is indirect and uncertain. Furthermore, lower income tax rates don’t affect the three drivers for the declining return on labor. They could, however, increase income inequality; the rates on capital gains is already much lower that the rates on earned income. Another problem with relying on the income tax code to encourage job creation is that law-making is influenced by special interests. Congress is the Wizard of Oz of tax policy: a benefit of an employer payroll tax reduction is that legislators will not feel compelled to cry out “Pay no attention to the (lobbyist and campaign contributor) behind the curtain!” That’s because there will be broad support for changes that encourage employment of U.S. workers. How to pay for it? A tax on the sale of securities in the secondary markets. One paid when a stock or bond is sold by an investor to another investor (i.e., not when it is sold by a company to raise capital). Effectively, it would be a sales tax on transactions that generate the return on capital. A minuscule tax rate would cover it. A higher one could be used to help make healthcare and education more affordable, something that would ease workforce anxiety and position it to be more productive. Direct solutions trump indirect ones. A tax on the return on capital to underwrite the needs of those who rely on the return on labor makes economic sense—it promotes job creation and growth. It makes political sense too: the net loser from the three drivers vote—foreign workers and robots don’t. 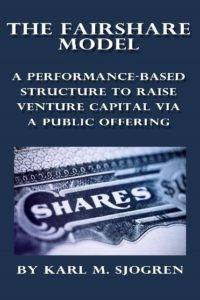 Karl M. Sjogren is writing a book about an idea for a performance-based capital structure for companies that seek to raise venture capital via a public offering. It is called The Fairshare Model because it balances and aligns the interests of investors and employees…capital and labor. This entry was posted in Uncategorized on May 7, 2017 by Karl M Sjogren. On October 10, 2015, the financial/economic education website Storm of Beta (www.StormofBeta.com) published an extensive interview with me. Storm of Beta is a website that focuses on financial and economic insights. Its “penny for your thoughts” series covers insights into behavioral finance and its implications and applications to financial markets. 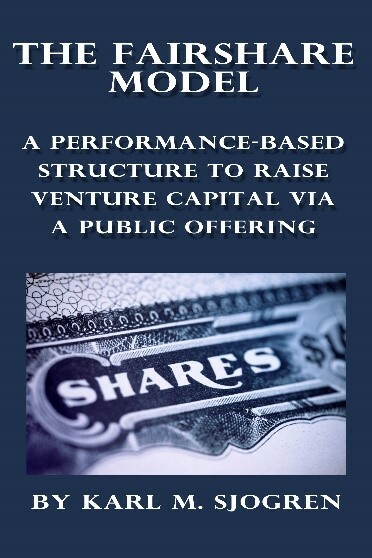 That focus brought The Fairshare Model to the attention of Storm of Beta, as it is nothing if not an application of behavioral finance to the public venture capital market.. This entry was posted in Uncategorized on October 11, 2015 by Karl M Sjogren. The September 24, 2015 update to the draft of The Fairshare Model book adds three chapters that discuss concerns that have been raised about equity crowdfunding. The principal focus is fraud, overvaluation and business failure. Particular attention is focused on the cause of failure and a common cause of it–management. This entry was posted in Uncategorized on September 24, 2015 by Karl M Sjogren. On May 28, 2015, I made a presentation on the Fairshare Model to the NewFinance Meetup group in San Francisco. The slide deck is under the Resources tab. When I made my October 2014 presentation (slide deck under Resources as well), I had just one chapter posted online–what is chapter two in the May draft. Now, fourteen chapters are online! Therefore, this latest slide deck has more to summarize. In particular, chapter ten on the Tao of the Fairshare Model (my favorite) and chapter five, Target Companies for the Fairshare Model. This entry was posted in Uncategorized on May 29, 2015 by Karl M Sjogren. This entry was posted in Uncategorized on May 6, 2015 by Karl M Sjogren. To date there only exits a fragmented source of knowledge on the Sector. This is reflected by the fact that the FINTECH sector is both recent in its development and wide in its scope. Therefore crowd-sourcing its content appears the best way to create a comprehensive book on the sector. Unlike other tech sectors the FINTECH industry will impact every one either directly or indirectly. Indeed if before finance was “needed by all but benefited a few” the FINTECH sector is now changing this by bringing back value to retail and institutional clients. The FINTECH book aims to become an educational and inspiring piece of work targeted to entrepreneurs, financial institutions, decision makers, investors and consumers. How does the Crowd-source process work? There is a 5 step process for authors and the community spanning from March until July 2015. Authors – Pitch their ideas by submitting via e-mail an initial 300 word article to the editors before the 30 April 2015. Authors – Define their ideas by choosing one of the pre-selected topics. Authors – Selected authors must expand on their initial articles to have a 2,000 word chapter by the 30 July 2015. Authors – Non selected authors will have their details and topic acknowledge in a special chapter. The editors will then compile and edit the work ahead of the publication of the Book, due November 2015. The March 8, 2015 update adds two chapters. Chapter ten explores the potential for cooperation–cooperation within a company’s micro-networks of shareholders, employees, customers and suppliers–to provide a tool for competition. Chapter ten explains the Tao of the Fairshare Model. This is my favorite chapter and it will pride grist for thought for anyone with an interest is the defining characteristics of capital structures. This chapter concludes Section II, which began by examining a range of ideas about two macro-economic concerns that provide context for the Fairshare Model—economic growth and income inequality. It then considered how the ability to cooperate creates might offer diverse ways to address these twin challenges and how Fairshare Model promotes this. This chapter identified two structural elements that determine how a capital structure allocates uncertainty in an equity financing, something that will inform the discussion about economic growth, income inequality and equity crowdfunding. It also presented the most remarkable aspect of the Fairshare Model—it provides venture-stage companies a reason to offer public investors a low valuation. As a consequence, the model enables a well-performing team to create more wealth for themselves than if they use a conventional model and to create competitive advantage when it comes to managing human capital. The tao of the Fairshare Model is clear—it is to balance the interests of entrepreneurial companies and public investors. This section has been broad in content and philosophical perspective. Section III returns to narrower micro-economic matters, issues that come into play when venture-stage companies raise venture capital in a public offering—valuation, fraud and failure. This entry was posted in Uncategorized on March 8, 2015 by Karl M Sjogren.